In the last two chapters, noise handling strategies are proposed to extend the traditional differential evolution (DE), in both single- and multi-objective optimization settings, to proficiently track global optima in noise-induced multimodal fitness landscape(s). 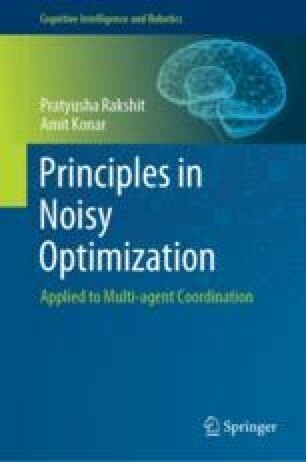 This chapter extends the traditional single-objective artificial bee colony (ABC), particle swarm optimization (PSO), and firefly algorithm (FA), and their respective multi-objective counterparts, with the noise handling stratagems already introduced in the previous chapters. These evolutionary and swarm optimization algorithms are selected as the basic algorithms for their wide popularity in the domain of meta-heuristic optimization with respect to computational accuracy and run-time complexity. The objective of this chapter is to study and validate the efficacy of the search dynamics of these well-known evolutionary and swarm algorithms to proficiently identify the global optima in the presence of stochastic noise in the fitness landscape(s). Experiments undertaken on noisy versions of the standard benchmark problems reveal that the extended versions of single- and multi-objective ABC outperform their contenders in most of the cases. The comparative analysis of the extended algorithms on the real-world multi-robot coordination problems in the presence of noisy sensory data also substantiates the quality performance of the proposed noisy versions of single- and multi-objective ABC over its contenders.